It’s no secret that one of the best places to get a bird’s eye view of Chicago is from the Hancock Observation Deck. Even locals can attest to noticing a little something new each and every time they visit. If you’re looking for spectacular views and fun activities, then you must check out what to do on your next trek up to the 94th floor. Remember, it’s a great place for the entire family. 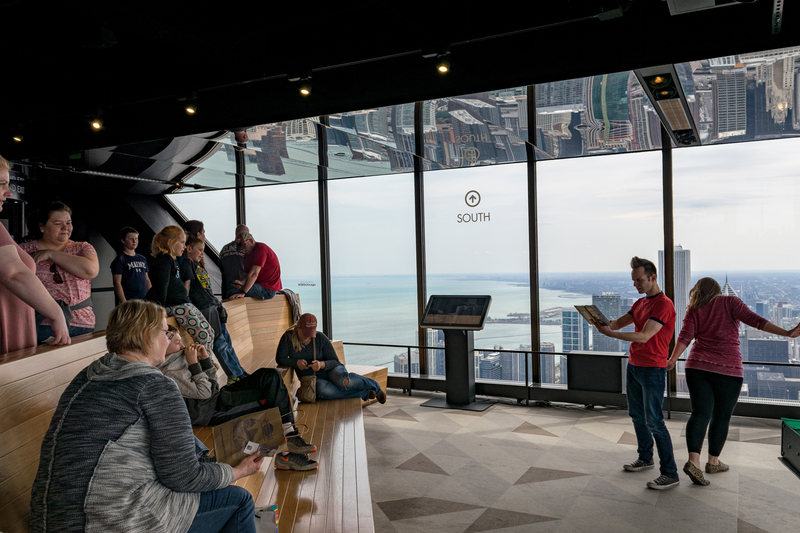 Whether you call yourself a professional photographer or you’re still developing your skill-set, every Monday from 9am-11pm, you can take your tripods to get the most spectacular imagery from the 94th floor. Imagine capturing sunset images of the skyline, city lights and mesmerizing views with your fellow photogs. Do you want to learn a little more about the architecture of our great city? Take part in the 360 Sky Guide tours that are led by Chicago Architecture Foundation volunteers. Each Tuesday from 6 p.m. to 9 p.m., learn more about the buildings you admire. On Wednesdays, bring your easel and canvas and really capture the beauty of Chicago’s stunning architecture in a painting, or illustration. Participants will be given a folding chair and plastic floor covering, you just need to bring your imagination. From the months of June through August, please note that this activity is paused during these heavily-trafficked months. Take your Thursday nights to new heights with this Sky Series brought to you by Revolution Brewing. Enjoy unique brews, a DJ, board games and big-screen TVs from 5:30 p.m. to 8:30 p.m.
Every Saturday from 9:30 a.m. to 10:30 a.m. yogis, can take part in 360 Sky Yoga. 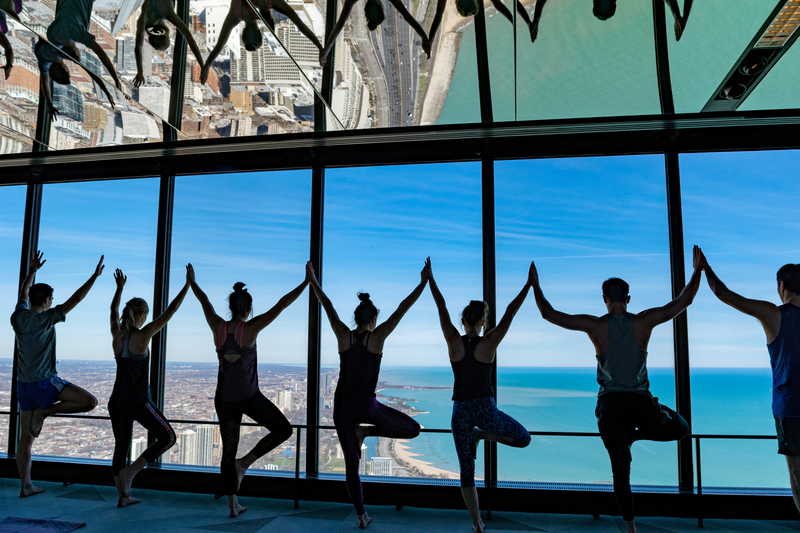 Welcoming all skill levels, this hour-long class will awaken your senses as you go through gentle flow movements while you take in an incredible view of Chicago. After class, enjoy even more spectacular views as general admission is included in the $25 class fee. Arrive 20 minutes before class and bring your own mat. Register here. Who doesn’t want to spice up their Sunday? We know we do. Perfect for the kids, this family-friendly day is packed with fun, including entertainment from 1 p.m. to 3 p.m. with Myster AJ’s magic and storytelling led by Super Epic Story Time. Guests from the city can take advantage of 606 Appreciation Rate with half price admission for kids from 9 a.m. to 4 p.m.
Take your fear of heights and run with it by trying the world-famous TILT. 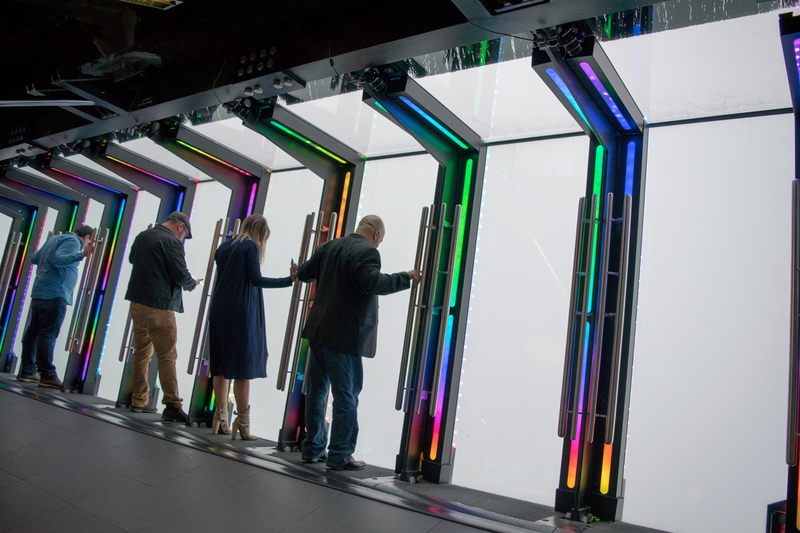 It’s not only the first of its kind in the entire world, but you will literally tilt over The Magnificent Mile and see a view of our gorgeous skyline—from 1,000 feet up. And, seeing this during a sunset is, in our opinion, the best way to do so.